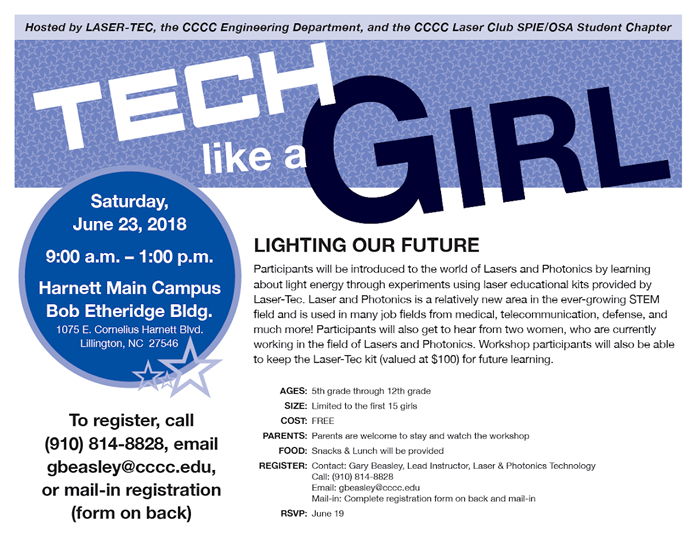 LILLINGTON - The Tech Like A Girl workshop will be held from 9 a.m. to 1 p.m. Saturday, June 23, at the Central Carolina Community College Harnett Main Campus, Etheridge Building, 1075 E. Cornelius Harnett Blvd., Lillington. The event is hosted by LASER-TEC, the CCCC Engineering Department, and the CCCC Laser Club SPIE/OSA Student Chapter. Participants will be introduced to the world of Lasers and Photonics by learning about light energy through experiments using laser educational kits provided by LASER-TEC. Lasers and Photonics is a relatively new area in the ever-growing STEM (Science Technology Engineering Math) field and is used in many job fields such as medical, telecommunications, defense, and more. Participants will get to hear from two women currently working in the field of Lasers and Photonics. Workshop participants will be able to keep the LASER-TEC kit (valued at $100) for future learning. The free workshop is open for girls in grades 5 through 12, and is limited to the first 15 girls to register. Parents are welcome to stay and watch the workshop. Snacks and lunch will be provided. Registration is due by June 19. To register, contact Gary Beasley, CCCC Lead Instructor, Laser & Photonics Technology, at gbeasley@cccc.edu or call 910-814-8828.
majors/lasersphotonics/ or call Gary Beasley at 910-814-8828, or email at gbeasley@cccc.edu.